Business continuity plan is needed in order to maintain the organisational survival. It estimates that 25% of the businesses, especially small ones, do not service most of the crises that affect their operations because they are not ready. Business continuity plan not only ensure the organisation’s survival but also minimise the crises impact on the business. Employees and customer will be more loyal to the organisation and its brand knowing that the organisation will always deliver its products or services during difficulties and crises. Expert in risk management with experienced employees in the organisations uncover the potential risks sounding the organisation’s operations. Each risk is classified according to its severity and likelihood. The risk is later treated according to its ranking. Organisation appetite toward the risk will decide to either avoid, control, accept or transfer the risk. The risk treatment is intended to find the principal actions, personnel and services needed to manage the incident and the recovery process after the incident. Risk appetite is the risk tolerance the organisation is will to take. Avoiding the risk, will element the risk completely but at a very high cost. 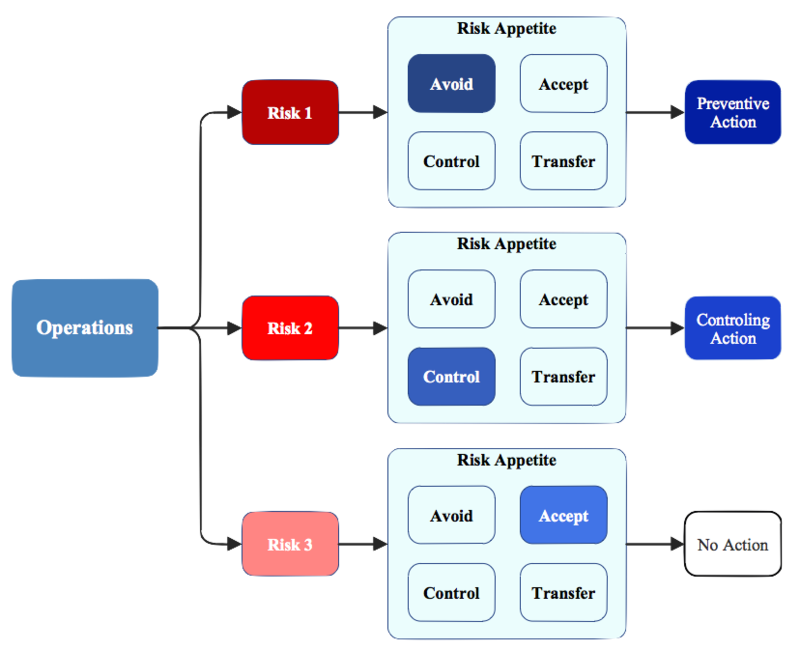 Controlling the risk would be bearing the risk while taking measures to reduce its likelihood to hapen add or reduce the severity of the risk if it takes place. For example, you may drive over the speed limit on the highway while accepting being caught by the police, pay fine, get delayed and other consequences. If you are not caught by the police, then you may continue speeding while controlling the risk if it may take place by driving a well maintained car with good breaking system and a new set of tyres. The business may wish to transfer the risk by outsourcing that part of the operation to more that one company in separate locations. This may increase the cost, but the risk is taken to another entity. While studying the risk around the organisational operations the working team will show the inefficiencies in the current operations. The working team will have a clear idea of how your business works and where are the vulnerable points in the business. Continuity plan actions for those inefficiencies will be a safe venture to elevate the way business is done internally and externally. The business continuity plan will be a valuable communication plan during incidents and crises. The plan communicates the right information to the right person at the right time. The plan will show the stakeholders the commitment to delivering during crises. A dedicated professor I was enjoying his class many years ago used to say to us that his carry-on bag is his whole life. After six months, I noticed that he changed it to a wheel bag. When I asked him about the new bag he told me that he switch to the wheeled bag because of his back problem and the old carry on bag was stolen from him during his summer vacation. In the bag, he had his research notes, his laptop with all his scholarly projects. The problem was he did not back up the data on his laptop or copied his notes and he had to start all over again. Online back up service worth of $50/yr could have automatically backed up all his documents every time he got connected on the Internet, but I guess he did not think of losing his bag because it was his life. A start-up online music store builds up a valuable customer database which they used to announce their latest additions and generate sales. Site host shutdown the online store after accusing them of music piracy. Part of the shutdown was freezing all data including the customer database. The online store could have been launched from another site host, but the customer database and the domain name were not accessible which meant the end of the online store.